Do You Have to Use a Laxative & Salt Water Flush on the Lemonade Diet? Based in the Washington, D.C. metro area, Sarah Nyako has been writing professionally since 2008. Her area of expertise is health, fitness and the pharmaceutical industry. She is currently working towards a master's degree in medical writing. The Lemonade Diet is also known as the Master Cleanser -- a popular fad diet. The salt water flush and laxative consumption are one of the lesser known components of the weight-loss strategy. According to the diet’s website, these are officially recommended parts of the diet. However, you should consult your doctor before beginning the salt water flush and laxative portion, as these may cause health complications. 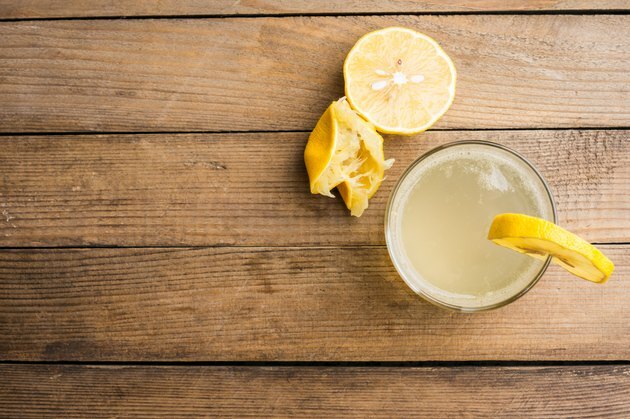 The Lemonade Diet is a liquid-only diet that claims to detoxify the body. The diet is supposed to be followed for a minimum of 10 days, and some choose to fast for longer. You subsist entirely on water and lemonade. The lemonade is made of a mixture of 8 oz. of purified water, fresh lemon juice, cayenne pepper and grade-B organic maple syrup and consumed six to 12 times per day, depending on your weight, energy and hunger levels. The salt water flush is supposed to be done every day while following the Lemonade Diet. The solution is made by mixing 1 liter of lukewarm water with 1 to 2 tbsp. of sea salt. This mixture is consumed rapidly, producing a series of bowel movements within half an hour to an hour, which can last for an hour or more. It can be done in the morning or at night at whatever time best suits your schedule. If the salt water cleanse does not empty your bowels, you can try drinking a tea with the laxative senna leaf. According to the Master Cleanser website, some people do both, but it is not recommended. The laxative tea is generally taken at night and it works overnight and results in a bowel movement in the morning. There are many possible risks with the Lemonade Diet. According to the FamilyDoctor.org editorial staff, fad diets are often lacking in nutrients and unhealthy. Additionally, liquid diets such as the lemonade diet may result in extreme hunger and binging, therefore undoing any weight loss achieved. The total caloric intake of the lemonade diet is only around 600 daily -- well below the minimum recommended intake for men and women, which is 1,500 and 1,200 respectively. Some side effects of low-calorie liquid diets include dizziness, headache, and feelings of weakness and lethargy. Laxatives should only be taken when you are constipated. Taking daily laxatives or doing the salt water flush may result in stomach cramps, diarrhea, and many gastrointestinal issues. Consult a doctor before beginning this diet. Is There an Apple Cider Vinegar Dosage for Constipation?